Everyone loves a good treasure hunt right? Not just confined to children, even adults who have a sense of adventure appreciate a treasure hunt! Change the map, add clues, the treasure, the setting or the companions and the treasure hunt is new and exciting! My son loves treasure hunts! I made him his first treasure hunt when he was 2.5 years old and his excitement has not wavered! We had a family picnic and my two sons were the only children attending, so I thought since I would be stationary feeding my 3 month old I would create a treasure hunt for my eldest and his dad to do for something fun that day! It wasn’t the most poetic treasure map but in 5 minutes it was the best I could do before he caught me scoping the site and writing! The treasure chest was an old broken tool box, I included some cars, chocolate and some great gems I made that froth up when you spray vinegar on them. I wanted to have as much to do as possible for him just in case we had to sit down and eat lunch. It was so much fun and was really easy! 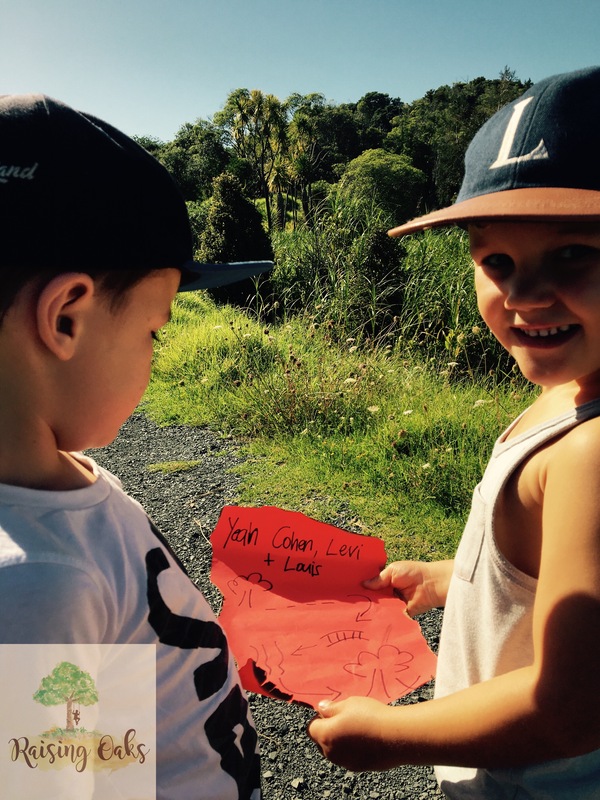 Another time I chose to create a treasure hunt was when my son had a friend to sleep over, that morning I was desperate for some fresh air and would have loved to go on a bush walk. The boys weren’t keen on a ‘bush walk’ so we went on a treasure hunt in the bush instead! This was a great success and didn’t take much time to set up. I drew a few markers like go over a bridge, up some stairs, around to the left, go past a silver fern (all things I knew would be in the bush) and under a tree (no brainer in the bush) there they would find treasure. I only used picture clues so they could follow the map themselves and promote their teamwork. The boys pretty much ran through the bush without realising I had also got what I wanted too, my bushwalk! Recently my youngest had pneumonia so we were more limited with where we could take him so I created a backyard treasure hunt that was a checklist of things that he needed to find outside. 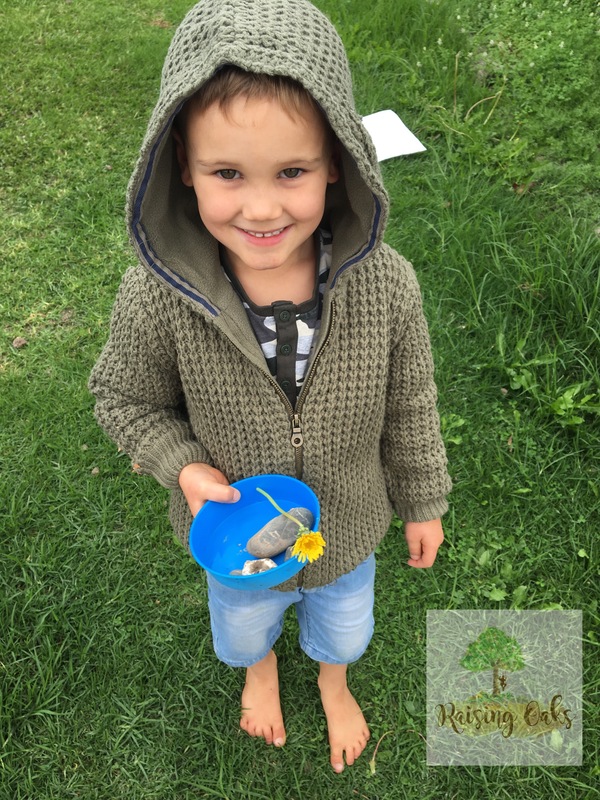 I added a certain amount of each of the treasures he had to find to include some numeracy practise and even added an activity that included the use of Information Communication Technology which was using my cellphone to take a photo of something he thought was beautiful. Take into consideration the age of the children you are working with, what is an appropriate number of clues or length of map before they get to the treasure. Can the children read? If not draw a map and draw the clues or read it aloud to them, my most recent one had a mixture of writing and picture clues so my son could do it on his own while I tended to his little brother. It doesn’t have to take you long to create a treasure map you only need to have sited the area to draw and write clues. Make instructions clear and concise. At times I have hidden the treasure while the kids are busy with another adult or if I have been on my own I just distracted them while I threw it under a tree. Why not dress up and get into character it makes it all the more fun! Your attitude is contagious, be enthusiastic and they will be too!